Asymmetric survival multiplayer game Dead by Daylight is getting a little long in the tooth, but it looks like it’s still capable of a surprise or two. Released on PC in 2016, it’s since appeared on PlayStation 4, Xbox One and will soon release on the Switch. Since its launch, the game has seen a steady stream of DLC, including appearances from Freddy Krueger, Leatherface and Michael Myers (and allowed players to take control of Laurie Strode). And now it’s looking like you’ll be able to step into the shoes of Bruce Campbell’s Ash Williams. The clues came with the Demise of the Faithful update, which introduced some interesting new perks in the Kill Your Friends mode. These include Mettle of Man, Flip-Flop and Buckle Up, and are all termed Ashley J. Williams perks. Fans of Evil Dead will, of course, know that these reference lines from across the famed horror franchise. So, if Ash was to make an appearance in Dead by Daylight, what form could he take? Given that by the end of Army of Darkness he has a prosthetic cybernetic hand that he can attach a chainsaw to, it might make him a bit overpowered compared to the rest of the survivors. However, if the developers want to avoid that, they could use Ash from around the beginning of the franchise where he’s just a goofy dope rather than a one-man deadite slaying machine. 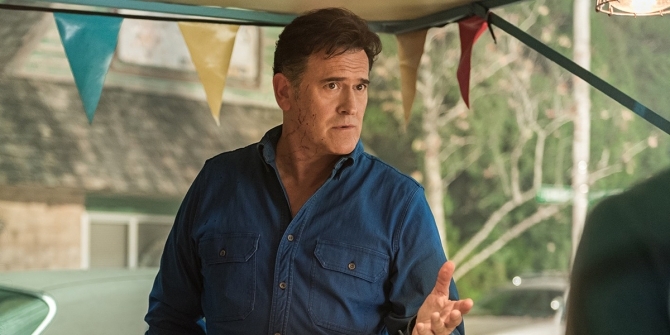 Another big question is whether Bruce Campbell would return for voice work. After the cancellation of Ash Vs. Evil Dead, he claimed to be done with the role. However, in January 2019, he commented that he would be doing some Ash voice work for a video game, so this may well end up being that and could also be the final Ash performance the actor will ever do. Here’s hoping this rumor pans out into something concrete. Dead By Daylight has arguably been superseded by Friday the 13th: The Game, but this could be just the ticket to inject a little horror fan hype into the title.